A new exhibition by Broadstairs mosaic artist Martin Cheek opens in Ramsgate tonight (January 16). For this exhibition, he is showing a glass tryptic and many other new works. The private view tonight includes a 15 minute talk on some of his processes and techniques, launching this new work before embarking on his annual two-month workshop tour of the USA. One of the works in the display features punk inspired Secretary birds. Martin said: “Secretary Birds are really vicious, stamping on snakes and killing them with sharp claws…so I made mine as Sid Vicious, complete with cut-off jeans and punk hair do! He says his mosaic work is a logical progression from animation, both of which involve displaying character and movement, from thousands of elements. 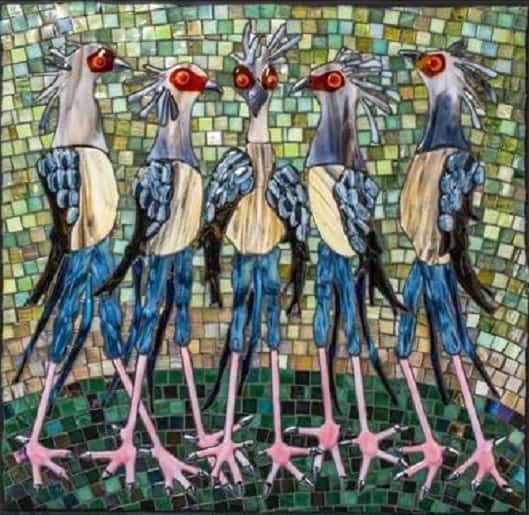 His mosaics have been featured indoors and outdoors in swimming pools, murals, tables, floors, and sculpture, including a garden for children with special needs. 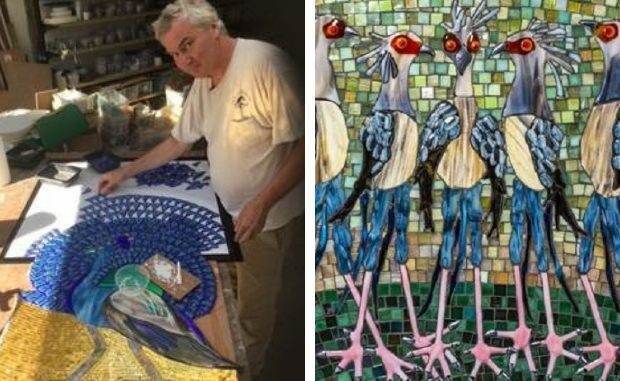 He has been creating his works for more than 30 years and pioneered the use of hand-made glass fusions in mosaic. Martin’s exhibition is being held at the gallery at Nice Things in Harbour Street. It is open every day between 11am-5pm, with free entry and a surrounding collection of handmade textiles, ceramics and Jewellery, by makers throughout East Kent and beyond. The private view is from 6pm to 8pm. The exhibition runs until January 30. More information is available at www.thegallerynicethings.co.uk or www.martincheek.co.uk.